The Tiny Soul-ar ECO Village (TSEV), Is different than many ECO Villages, in that a significant number of the residents will come here to affordably build their Tiny House and when done, they will move, with their house, to a different location. Because TSEV serves as a Tiny House Incubator, it will encourage and support others to live simply and lightly on the earth. The details of how the TSEV are spelled out below. It is my desire to foster a community of cooperation and philanthropy in hopes that later, in future years, the villages past “residents” help this and others like it succeed. TSEV is a compact community designed to encourage, educate, and demonstrate how to live simply, respectfully, and kindly. By living simply, each member of the community would be helping our environment, on a personal level, in a substantial way, by living each day responsibly. The advisory council would work to continually focus on helping others in the TSEV, their greater community, and the world. The example below is only ONE CASE Scenario. Other ideas, options, situations are possible. 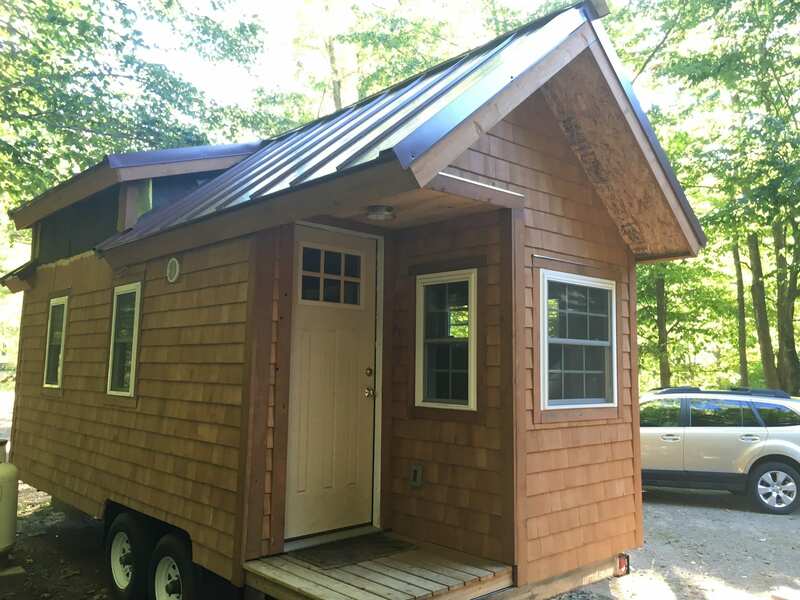 A resident would pay $300.00/ month in rent to live in a Tiny House owned by TSEV. The resident will agree on a specified amount to put aside each month in order to purchase supplies needed to build their own Tiny House. Perhaps $500.00/ month. That would be a total of $800.00/month plus their small utility and heat bill which is an average rent amount. If a resident spent $800.00/ month for about 4 years they would own their own Tiny House costing about $27,000.00 in materials during that time. They would own their Tiny House outright and would take it and relocate to their own land, a friend’s, back yard, their parent’s driveway or some other location. If they didn’t have a place to go, they could move their tiny house to a different location at the village and pay a lot fee of say perhaps $50.00/month plus their utilities. While on this lot, they could save money for the next 12 months or so in order to purchase a piece of land somewhere else. The resident would still need to participate in cooperative production at the TSEV. Although not a requirement, it’s my hope that they enjoy the cooperative aspect of the TSEV, and want something similar for themselves. I would be happy to help them start another ECO Village in a different part of the country, somewhere they have personal connection or desire to settle. By doing this, we could build pockets of cooperative and affordable villages across the country and world. Must conform to surroundings, local municipal ordinances & approval of advisory counsel. Tidy appearance with no outside clutter.